Home » comedy , gordon freeman , half-life , humor , large hardron collider , science » Gordon Freeman is at the Large Hadron Collider! 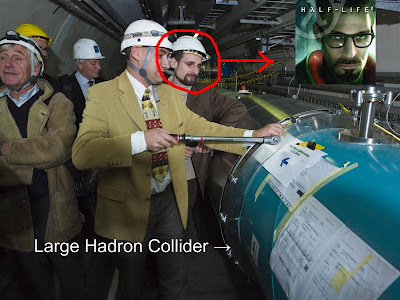 Gordon Freeman is at the Large Hadron Collider! popgive.com found this photo of some scientists working on the Large Hadron Collider (which began operation this morning and it's yet to destroy the world), including one in the group that bears a very striking resemblance to Gordon Freeman, the protagonist of the Half-Life video game series. Just an odd coincidence, I'm sure. But if that guy shows up in any more photos and wielding a crowbar, it might be a good idea to stock up on some rations and shotguns.